The ATEM 1 M/E Advanced Panel features newly designed buttons and LCD based labels that help improve clarity and reduce incorrect key presses. The buttons have customizable color backlighting to indicate status and activity. In addition, dynamic displays are placed above and below the buttons. These provide customizable text, multi language support, and the custom label colors. The combination of button colorization and customizable text labels help customers quickly identify important keys while working on high pressure, fast paced live switched programs. The layout of the panel has been designed with the help of professional broadcasters. The ATEM 1 M/E Advanced Panel has a new custom design T-Bar fader and buttons that are logically grouped in a familiar broadcast layout, so customers with experience using older panels can get up and running quickly. Dedicated groups of buttons are spaced apart so controls for things such as transitions, macros and keyers can be quickly located and used without the risk of accidentally hitting the wrong button. The ATEM 1 M/E Advanced Panel features a shift button that doubles the number of inputs that can be controlled from 10 to 20. The new M/E selection buttons allow control of up to 4 independent M/Es on a single panel so customers quickly switch between and control up to 4 mix effect rows, effectively enabling total control of a 4 M/E switcher from a 1 M/E hardware panel. 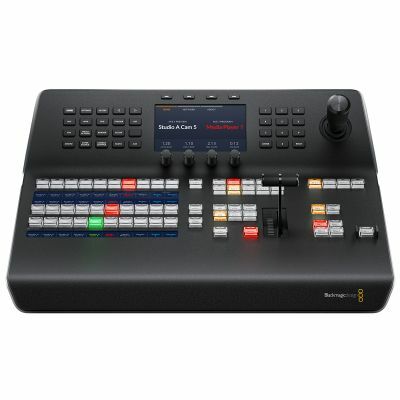 This makes it possible to use the ATEM 1 M/E Advanced Panel with the new ATEM 4 M/E Broadcast Studio 4K. Next Transition Selectors BKG, Key 1 - Key 4. DSK Transition Selectors Auto, Cut, Tie/Preview.